Counting is at the core of GenderAvenger’s mission: how many women vs. men are represented in a public forum? Data quantifies imbalance and, for the naysayers, it’s a losing battle to argue with hard facts. This week, Linda Stein shares findings from her study on gender imbalance in the forum of public opinion. On Monday, January 2, 2017, the New York Times presented an all-male lineup in its "Letters to the Editor" section — not one female. 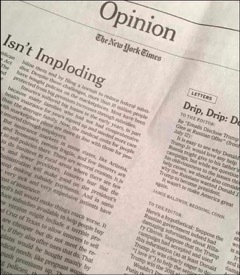 After noticing gender imbalance in the Times' Op-Ed section for years, my annoyance and curiosity were piqued. I examined that day’s "Letters" to see if the highlighted topics were skewed toward men. They weren’t. I was troubled and would have expected that, in 2017, the published letters would have been more gender-balanced. I decided to investigate, working with interns at my non-profit, Have Art: Will Travel!. Would my study for "Letters" match my past research as an artist in the art world, where sexism is alive and well? Sadly, my three-month study of the Times’ published "Letters to the Editor" confirmed my fears: the vast majority were male-authored. Of the 794 published letters that we could identify by gender, 63% were by men and just 37% by women. I pondered possible reasons for this imbalance. Perhaps women submitted fewer letters? Mallary Jean Tenore wrote in Poynter that "there aren’t enough female voices in the opinion pages" and that the "root of the problem… isn’t so much that news organizations aren’t featuring female contributors; it’s that they aren’t contributing in the first place." Tenore’s essay was written six years ago. Was this still true in 2017? I planned to find out. In March, I wrote a letter to the Times editor requesting the paper’s submission statistics by gender. Within an hour, I received responses from the editor of "Letters", Sue Mermelstein, and the Public Editor, Elizabeth Spayd. We are aware of the fact that sometimes our "Letters" page is dominated by male voices. This reflects the fact that a large majority of our letter writers are men — why, we’re not sure. We don’t keep statistics, but a simple scan of our inbox makes this quite evident. This is apparently true of opinion pages and comments throughout the industry, from what I’ve read. We pick letters based on merit, not gender. Typically, we decide that we want to use a letter well before we reach the signature line, so we pick them gender-blind. That said, we do sometimes try to get a better gender balance if we find that we’ve picked only letters from men on a given topic… I’d like to point out that the time frame that you are studying may not be representative. Politics has of course dominated our pages in the last few months, and our politics letter writers skew even more disproportionately male than the norm. We find that certain topics, like education and health, tend to draw a larger response from women. The bottom line is: We wish more women would write letters to us! I hope that’s helpful… If your article prompts more women to write letters to the editor, we’d be thrilled. This response was encouraging. Not only was the editor a woman, but she was also aware of the situation and eager for it to change. Elizabeth Spayd, the Times Public Editor, wrote in The Declining Fortunes of Women at the Times "Women have skidded down the power structure… with fewer females leading big news departments and fewer coming up the pipeline. Thus, fewer women decide what big stories are assigned, what broad coverage priorities are set, and what a re-envisioned Times should look like." Spayd offered that being "the only woman in a meeting can produce a feeling of having walked into the men’s room. But more significantly a gender, or racial, imbalance changes what’s considered news." She concluded that "If more seats are to be taken up by women, in critical coverage meetings and in top leadership, it will be up to men to make that happen. They are, after all, the ones with the power to do so." But women can’t sit around and wait for men to give up power. We must be active, assertive, ambitious and, even (gulp) aggressive. You’re welcome. And you’ll be happy to hear that we are making an even greater effort to be sure that more women’s voices are on our page but that would be much easier if more women would write letters. We now know that the Times is "making an even greater effort" to publish letters by women. We hope more women will welcome this opportunity to make sure their opinions are heard. Linda Stein has two traveling solo exhibitions, The Fluidity of Gender: Sculpture by Linda Stein, and Holocaust Heroes: Fierce Females: Tapestries and Sculpture by Linda Stein, traveling the country through 2025. Her web site is: www.LindaStein.com and her art archives are at Smith College. Her educational archives, “The Linda Stein Feminist Art Education Collection” are slated for Penn State University. Stein is Founding President of the non-profit 501(c)(3) corporation, Have Art: Will Travel! Inc.